"We have friend whose name is Robert Harding. I want to know if you’ve met him, Robert Harding?" asks Jack Hanson as he speaks to another World War II veteran Sam Hayward, following the anniversary ceremony. "He worked as a plane handler," explains Jack. "That means he took the planes after they landed down to an elevator. He said it was pretty hard work." Hayward shakes his head no. "I hate to tell you," he says. " But the truth is I can’t remember too good now." Hayward has quite a story himself. He grew up in Charleston's Jenkins Orphanage and played slide trombone. He joined the Navy to escape the south and Jim Crow laws. He boxed on the ship and worked as a cook. The boys listen closely, asking plenty of questions. 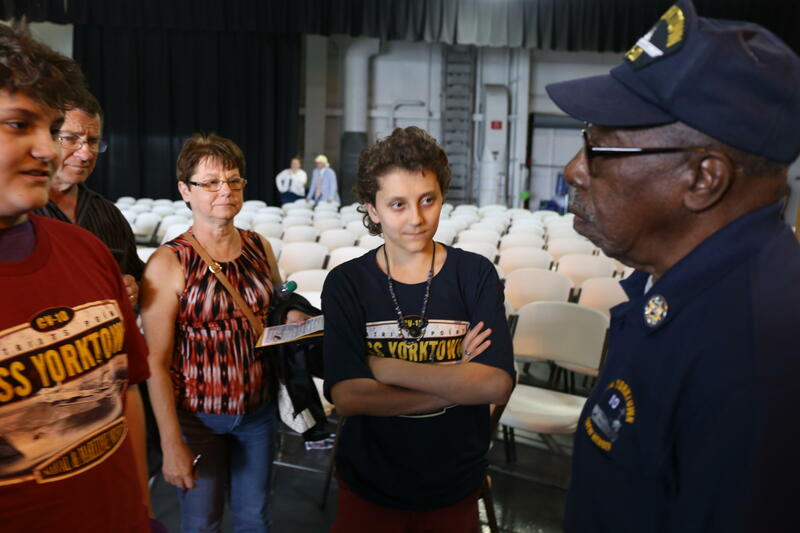 They talk to the handful of World War II vets who are left. They are extremely interested. Reporters who've come to cover the ceremony have since gone. "There are so many things that happened in history that it likes blows your mind," says Jack. "It shouldn’t have happened, but did happen." It's like their friendship with Mr. Harding. Carter says it all started with a game about battle ships. They got to know the names of different ships and their roles in battle. "I eventually learned about a battle ship called Yamato," he says. "We didnt' know this ship (the Yorktown) helped sink it," says Jack. "We started looking into ships and we were like, we're so interested. We're so interested." So their parents made a surprise stop on a family trip heading from North Carolina to Florida. 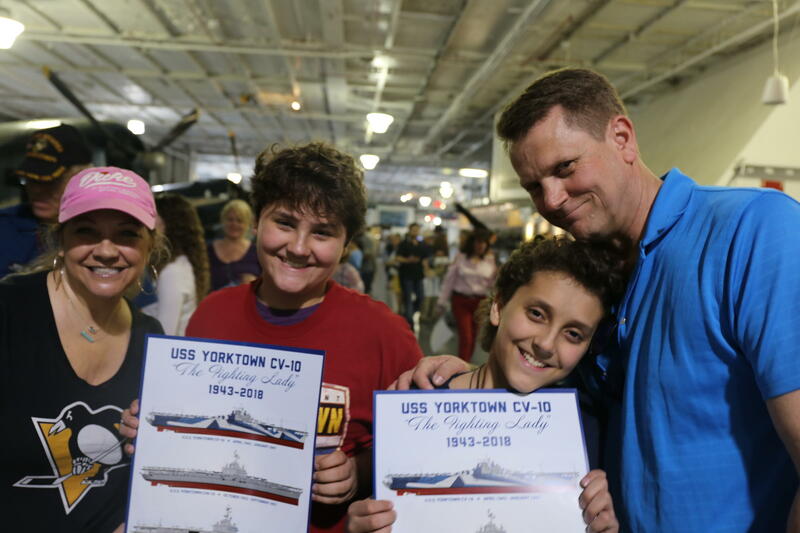 They visited the USS Yorktown and as they both like to say, "they were blown away." That's where they met Robert Harding's sister, who gave them his email and the rest is history. Harding could not make it to the Yorktown anniversary celebration this year because he is recovering from a broken hip. He turned 92 years-old in March, but unfortunately had to spend his birthday in the hospital. The boys didn't forget. They sent him a gift, a flag that once flew aboard the Yorktown. "You know, I thought that was just great," says Harding by phone. "I am very touched by the boys and their attention to me because it's so unusual that the boys are attached to somebody like me." Harding says they email once or twice, sometimes several times a week. "They ask questions about what happened," he says. "But I'm getting kind of short on stories now." "At first the emails were about the ship and war," says Scott Hanson, the boys' father. "Now it's personal questions like how was your vacation or did you see that ball game last week?" The family stands in line to meet the great granddaughter of Eleanor Roosevelt, Nancy Ireland. She rechristened the ship as the former first lady originally did. "Oh I know who you are," she says as she see the twins. They are hard to miss; teenage boys excited by history. What's more, they're getting their friend a gift. 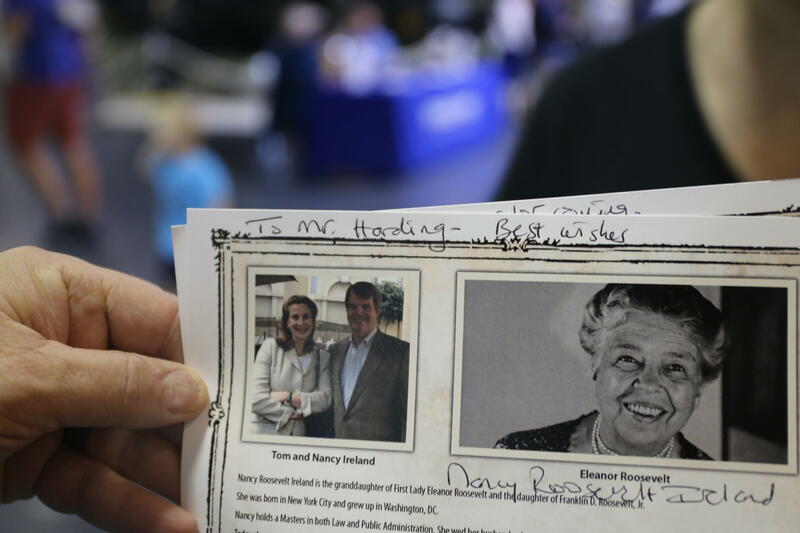 It's an autograph to Mr. Harding from the woman they excitedly call, "a real Roosevelt." "Those are my kids," says their mom Lisa as her eyes fill with tears. "Those are my boys."